"UFO" over Jerusalem Temple Mount !!! For decades now, we have had the UFO phenomena. This really began about 1947, the year Israel became a nation again. 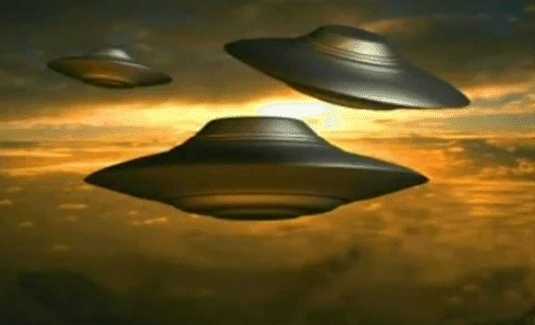 Maybe millions of people have seen UFOs, while others do not believe the reports at all. I myself saw something amazing and unexplainable when I was a boy. It was a slow moving, multi-colored fireball at low altitude. 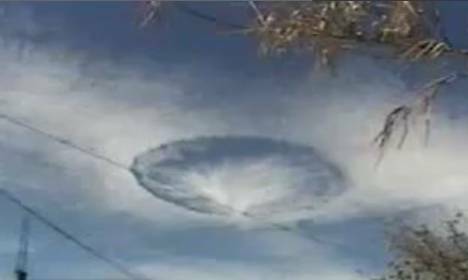 Recently, we all heard about and many of us saw the video of the "UFO" wormhole at Copenhagen, Norway at the global warming summit (Dec 2009), and strange holes in clouds over Mexico and Russia. Certainly something is going on, but what? 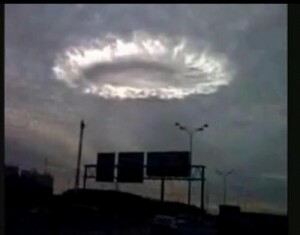 Hole-clouds over Mexico and Russia - I've never personally seen any clouds like this in my life, have you? 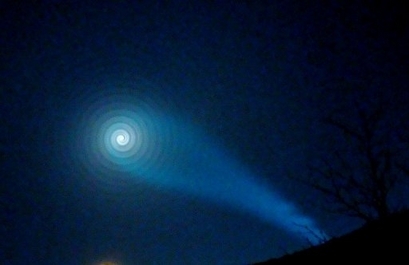 Strange spiral light over Copenhagen which appeared during the climate change summit. rockets over Copenhagen during a summit of which they were a part? But what are the characteristics of UFOs? Well for one, they are very elusive. And they are reported to do physically "impossible" manoeuvres, such as high speed right angle turns. And they seem to tease us, giving us only glimpses. So why would they fly billions of miles to reach us, only to tease us? 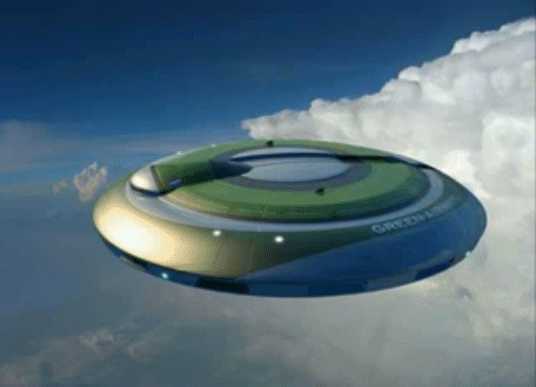 To get here, they would need to be able to fly close to light speed. And along the way, they would need to avoid planets and meteors. Hitting the slightest bit of space dust when travelling at that speed would disintegrate their ship. So they would need not only the technology for near light speed travel, but also a way to "zap" objects in their path. Scientists have put a lot of thought into the technology needed to travel just to the nearest stars. The obstacles are huge. Think of ageing - if it takes only thousands of light years to travel to the nearest stars, the travellers would die long before arriving here. But lets suppose some aliens from another planet developed technology to do this. Why wouldn't they openly make contact with us after all that trouble to get here? Why play hide and seek? And what about "alien abductions"? People who have reported being abducted have said the aliens tried to tell them that Jesus isn't really the Son of God, and other such things about religious ideas. Now why would they travel all the way here just to teach selected people us about religion? In Luke 21:11 Jesus told us there would be "terrors in the sky and great portents" in the days before his coming. Could this be the beginnings of this prophecy? A. They are deliberately elusive. B. They are able to perform physically impossible manoeuvres. C. To travel from even the nearest star system, they would need technology so advanced that they would be completely invincible, yet they don't want to talk to us openly. D. When they did "talk" to some people, they taught them about religion - specifically about Jesus of Nazareth. For me it doesn't make sense that these apparitions are alien life from another planet. For an object to do a physically impossible turn (B), then it must not be a physical object. But lets say that since they were able to accomplish C, then they were able to figure out a way to defy physics. Then why would they play cat and mouse with us and abduct a few people and try to teach religious ideas about Jesus not being the Son of God? Folks, doesn't this have DECEPTION written all over it? OK, you say, but for what purpose? I can think of one very good purpose. If the 2 Rapture theory is true, then Satan certainly wouldn't want the people of the world who are left behind to believe the people who disappeared were raptured. No sir! That would be bad news for his continued deception over the world. But what if they were abducted by aliens? Well that would explain everything, wouldn't it? Have you noticed that for years now we have been "conditioned" by multiple Hollywood movies about aliens coming to Earth? These movies are very realistic. I think this has all been for a reason, which will soon make itself apparent to the wise. But for the masses, they will believe what the devil wants them to. But whatever we may think of these strange sights, remember Jesus' words: "There will be terrors in the sky and great portents".